Waukesha, WI – April 2018 – To meet customer needs for increased throughput and automated transfer of materials in multi-level operations, Wildeck’s XpressLift™ Automated VRC is the right product at the right time. Wildeck’s industry-leading VRC product development team has provided a quick and easy solution by integrating its fast-moving XpressLift™ with existing conveyor systems. The XpressLift™ will be demonstrated at the Modex 2018 Show (April 9-12 in Atlanta) in Wildeck Booth #B4747a. 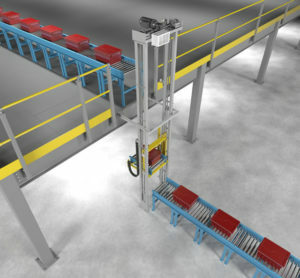 According to Hubert Schlegel, Director of Marketing at Wildeck, “The XpressLift™ VRC represents another step towards becoming the market leader in automated material lifts. The XpressLift™ incorporates the latest state-of-the-art components to make it easy to install, easy to maintain, and most importantly, easy to integrate into a customer’s material handling conveyor system. The standard “all-in-one” interactive controller features an easy-to-read text display on the control panel. Local vertical and horizontal jog control is also provided, along with lift diagnostics to simplify troubleshooting and preventative maintenance. According to Schlegel, “The trend in manufacturing, warehouses, and distribution center operations is increased automation that will shorten product delivery times to customers. With the safety features, functionality, and installation flexibility we are offering in our innovative XpressLift™ VRC, we are confident that it will meet customer needs for automated vertical material movement today, and for the future. Wildeck is in its 42nd year as the largest manufacturer of industrial steel work platforms (mezzanines), VRCs (vertical reciprocating conveyor), and safety guarding products. The XpressLift™ Automated VRC is designed and manufactured to meet ANSI/ASME – B20.1 “Safety Standards for Conveyors” and can quickly transfer totes, cartons, or boxes of material at speeds up to 350 feet per minute. Units up to 18 ft. high can ship factory assembled, prewired, and fully tested, making integration into conveyor systems fast and hassle free.